Two of the nation’s largest states have seen the largest rent growth over the last year. Three major metros in California, and three in Texas, dominate the rankings of the Top 10 rent growth markets so far this year, according to Carrollton, Texas-based MPF Research. Physical conditions of housing units have declined since the last census in 2009, and the 2013 State of Healthy Housing report from the National Center for Healthy Housing reveals that a shocking 40 percent—or 35 million—of the nation’s metropolitan homes have at least one health or safety hazard. CoStar’s Property and Portfolio Research (PPR) division is forecasting that the wave of cap rate compression that has in some cases accounted for an astronomical 90% of the gain in core real estate value since the last recession is likely to slow. Specifically, PPR’s analysis of the top 54 U.S. markets finds that cap rates should remain within 20 basis points of today’s average through 2017, which will reduce the rate of real estate price growth relative to the recent past. 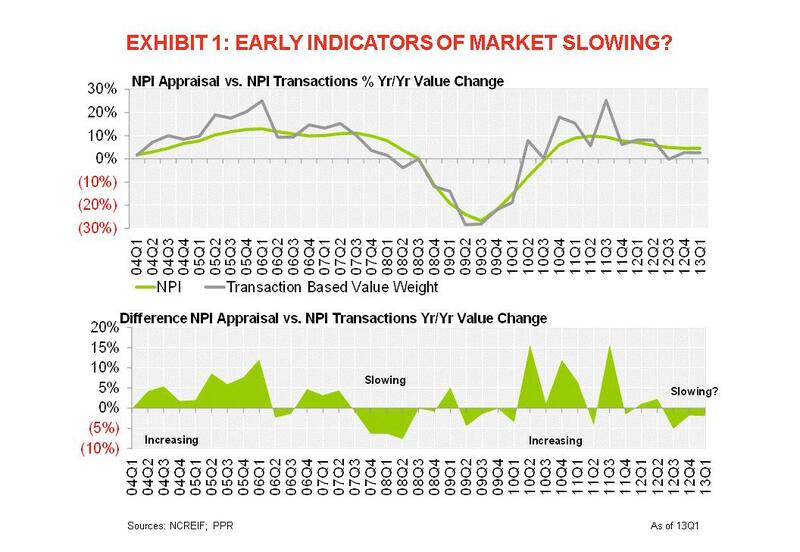 This is significant because transaction pricing tends to be an early indicator of appraisal pricing, and the last time transaction-pricing growth fell below appraisal trends was at the start of the recent recession, in the second half of 2007. The nation’s growth “is finally being driven by housing again,” proclaimed David Crowe, NAHB’s chief economist, during the association’s Construction Forecast Webinar. Home prices have been rising, partly the result of tightening inventory of completed new homes, which in turn is stimulating demand. Employment—a major factor in home-buying decisions—continues to strengthen, albeit incrementally. And housing’s recovery is now national in scope. The U.S. Census Bureau posted its March national residential permitting numbers on April 16. Privately-owned housing units authorized by building permit in March, measured on a seasonally adjusted annual rate (SAAR), were 902,000. This was a decrease of 3.9% from the revised February rate of 939,000, but was 17.3% above the March 2012 estimate of 769,000. Freddie Mac’s record year of $28.8 billion in new multifamily loans was spread somewhat equally across the country. The apartment and for-sale housing markets usually compete with each other. But what’s happening today is different, according to the economists at the National Association of Realtors (NAR). “Rental demand and housing sales are rising at the same time,” says NAR spokesperson Walter Maloney. What’s behind the seeming contradiction? The number of households is growing again after years of lagging behind the growth in the population. For years, graduates have been moving back home or sharing dwellings with roommates. Now, more people are striking out on their own. And this formation of new households is creating strong demand for both rental and for-sale housing. The for-sale housing market is recovering faster than seemed possible just last year. Many economists expected for-sale home prices to drop in 2012, such as the analysts at Freddie Mac. Instead prices rose more than 7 percent, according to indexes kept by both Case Shiller and the Federal Housing Administration. The number of sales is also rising quickly, despite the small number of homes on the market. You are currently browsing the archives for the US – COMMERCIAL NEWS category.